That statement is a declaration of my refusal to let my kangaroo pouch take over my life and my wardrobe. I will not resort to wearing elastic high wasted pants because I can no longer fit into my pre-baby clothes. From the moment my children were born my focus was on getting my body back. I love my children. They are my world, BUT I will not allow myself to carry around extra weight on my mid section (or anywhere else for that matter) as if it is some type of medal of valor–NO WAY! I had a c-section with all of my girls, so working out heavily was out of the question. Hell, getting out of bed was a serious task for the first 3 weeks after birth. So, here are my top 5 secrets for losing the baby weight in less than 3 months. 1. Request A belly band–Usually when you have a c-section they will give you a supportive/compression band that will hold your stomach in and help you gain strength in your back muscles. If you had/are planning on having a vaginal birth I urge you to request a band in advance. The band will help you gain strength and stability, as well as, firm up your stomach muscles that have weakened during pregnancy. 2. Breast Feed–Breastfeeding will help you burn calories as if you are going hard at the gym. Breastfeeding has been known to burn approximately 600 calories per feeding. Newborn babies have to be fed at least every 2-3 hours (and maybe more). So that comes out to 6 to 8 feedings per day. That is 3000 calories or more being burned every day without raising your heart rate or sweating out your perm. Oh and when you breast feed, it helps your stomach muscles contract almost like sit ups. 3. Eat 6 small meals per day–Let’s face it, when caring for a newborn baby there is very little time to eat, sleep, or even watch your favorite television program. Eating small frequent meals keeps your metabolism high, thus allowing you to burn off much of what you eat and a little extra just for good measure. Try this trick: Whenever you eat, eat out of a small dish. Whether it be a small container or dessert sized plate. Since the plate is small you will feel like you are eating more when you really aren’t. 4. 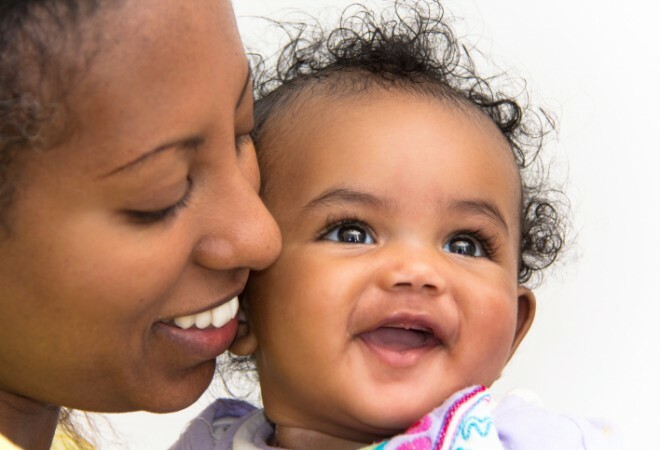 Walk It Off with Your Baby–Believe it or not, fresh air is great for newborn babies. Even babies born during the winter time. Most people will hesitate to take their newborns out in the cold for fear of them getting sick, but the opposite is true. During cold season, cold air may be the best thing for your baby. Germs live in warm environments and in the winter your house is the perfect place for germs to linger (you don’t want a sick newborn). Also, Vitamin D from the sun is great for liver development and will help reduce the risk of jaundice. So, while your baby is getting a nice dose of Vitamin D and fresh air, you can work up a sweat by walking for about 15 minutes once or twice a week. 5. Drink Naked–If you thought that I was telling you all to drink while naked, you need to get your minds out of the gutter. That type of behavior is only going to get you pregnant again, LOL. No, but seriously, consider drinking the fruit smoothie called “Naked“. They have great smoothies with all types of natural fruits, some drinks even have added protein and fiber. This drink is loaded with vitamins that are good for someone who does not have the time to prepare balanced meals.